RIP Amy Winehouse! Also Norway. I’m an enormous presence on Twitter, what with me constantly tweeting hilarious one-liners, non sequitirs, various other bon mots and insightful observations about anything and everything; re-tweeting this, hash-tagging that, trading witty barbs with other wags, one-upping them, occasionally (but rarely!) being one-upped myself; following tens of thousands of people, and being followed by – no surprise here! – many thousands more. My God, you can’t keep me away. There’s not the tiniest bit of minutia, the most seemingly insignificant detail of my day-to-day life that I would consider too run-of-the-mill, too dull, too mundane to share with the world in 140 characters or less. Hell, I’m not telling you anything you don’t already know, you surely being one of my aforementioned many followers. Aside from the personal joy Twitter has afforded me and the ways it’s enriched my life, the site has indeed been a godsend for many other lazy writers as well, especially when they need to file a story, any story, but don’t really want to exert any effort in crafting something themselves. Witness the flurry of articles you’ll see in any given week where the writer – or, really, the compiler – has simply culled a bunch of Tweets on a common theme. …Did you witness them? Well, you should. Yesterday I saw no less than three such pieces – yes, right here on the internet! – on a single theme: Celebrities reacting to the death of Amy Winehouse. Now, that’s to be expected – she was famous, she was popular, she made a song sound much more 60s-like than Zooey Deschanel. And Twitter was practically invented for celebrities, so many of which need to be center of attention every waking moment, so given a chance to issue some over-the-top, dramatic, tearful message, the stars came out in droves. So thank you, Kelly Osbourne, Kim Kardashian, Demi Moore, Ricky Martin, Soleil Moon Frye, Melissa Joan Hart, Ryan Seacrest, Usher, Adam Levine, LA band “Foster the People,” and those of you who I haven’t mentioned – for bravely sharing your feelings about what must have been difficult news to hear. The inclusion of a hashtag advertising her new reality show? Brilliant and tasteful self-promotion! 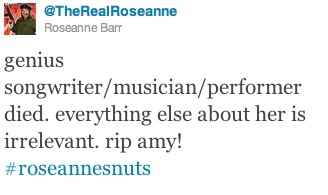 Good to know Roseanne’s as classy as she ever was. Shouldn’t that have ended with the tag “#insincereafterthought”…? Posted by Ted on July 24, 2011, 11:34 PM.